In the past, my brother and I usually celebrate New Year's Eve in Thailand because it is generally peaceful there during that time of the year. Also, almost everything is dirt cheap, from hotels, inns, food and pasalubong shopping. Yes, shirts, blouses, pants, bags and shoes are priced less than those in the Philippines. For us, however, Thailand is not only a shopping haven but also a place to immerse ourselves on the history and culture of the Thai people . For such immersion, one of our favorite destinations in Thailand is its ancient city of Ayutthaya, which lies about 90 kilometers north of Bangkok and boasts of numerous historic ruins. The cheapest and most scenic way to reach the UNESCO World Heritage Site of Ayutthaya, Thailand from Bangkok is by train. The train regularly departs from Bangkok's Hua Lumpong Train Station and makes a stop at Ayutthaya Train Station before proceeding to its destination. The trip usually takes about 1.5 to 2.5 hours depending on the type of train service. Second-class seats (A/C) cost 245 baht, third-class is just 15 baht (!) (there are no reservations and seats are not guaranteed). Trains from Bangkok to Ayutthaya leave from Hua Lumpong station every hour from 4:20 a.m. to 10:00 p.m. Check timetable first. (Please note that fares listed on the Thai railways site are out of date and incorrect). At the entrance of Hua Lumpong station, go past anyone who offers to help you and go to the ticket counter. Many of these very friendly people are up to something. Yes, even those who are at the tourist information counter near the entrance of the train station. They will try to offer you the services of the travel agencies at the second level of the station. 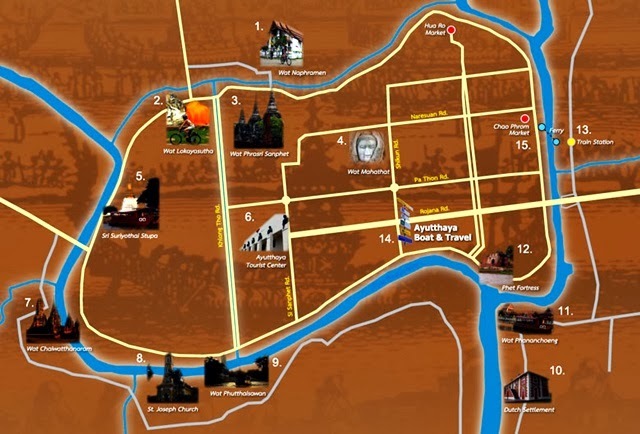 If you ask for a copy of the map of Ayutthaya, those at the tourist information counter may tell you that they ran out of maps and will offer to accompany you to the travel agencies at the second level to ask for maps. Once you get inside the office of one of the travel agencies there, the staff will persuade you to avail of their services and to take other modes of transport. You can always refuse and get copy of the maps just the same. 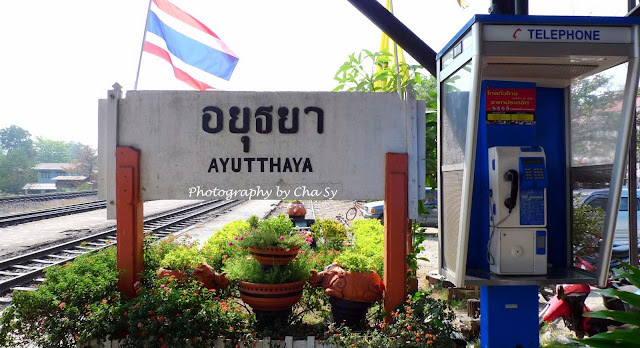 Note that you may also ask for copies of the map of Ayutthaya at the Ayutthaya train station. So, beware of persons identifying themselves as persons working for the railway station. They, more often than not, mislead and persuade you to use other means of transport. They may also give false information. We had a first hand experience of this scheme when we asked if the train for Ayutthaya has left already. The one we asked was offering to help us get a cab instead. It turned out that the train was still at the station. Although in the past, railway employees preferred not to sell 3rd-class tickets to foreigners, the employees, as of 2011, were explicitly offering 3rd-class seats to foreign tourists as a standard option. Also note that some train stations (for instance, Bang Khen) do not appear on the sites map, and that tickets may even be cheaper than those published in the internet. If you have local friends, they may have some good advice on how you can get cheap train tickets. The railway station at Ayutthaya is across the river from the historic city proper. You can take a short ferry ride across this river. From the railway station, you walk across the main road and down the small street towards the river. Ferry boats across the river run every few minutes and cost 4 baht. This is much cheaper than taking a cab or tuktuk that passes over a bridge towards the city proper. At the other side of the river, you can walk, rent a motorcycle or a bicycle to go around the historic sites.